EnigmaUO: First Dawn - The pre-alpha continued. Fixed bug with shopkeeprs taking the wrong amount of an item when being sold. Nightsight will now be removed upon death. Carving a humanoid corpse will no longer produce multiple heads. Lightning spell does slightly less damage. Bankers in Cove will now respon to voice commands. Numerous typo and literature corrections. Dueling system with bracket rankings and leaderboards "i wish to duel"
Adjusted the helmet idle animations for some directions, covering up hair and moving them forward to look correct. Corpse carving fixed. Body parts can be cooked with numerous objects. Simply double-click the body part and target a heat source. House placement will now correctly be allowed over chopped trees and some rubble. Humanoid corpses (including players) may now be carved. Upon carving, body parts such as legs, arms, torso and head now produce meat. Meat can be cooked down into jerky. Brains can be salvaged from heads. Fixed several issues with Blacksmithy & Carpentry menus. Shopkeeprs will now correctly restock. Mobile status and stats bug has been fixed. Vendors will not restock as intended. Small addition to the Labyrinth. Several gump and art corrections. Harvestables within the world now correctly regrow. Many performance and stability issues fixed. MyFD will now correctly display correct client growth. Several item labels and names corrected. Welcome new and fellow travellers! circumstances in my personal life. That is all about to change! Witness the return of the pre-alpha marvel free shard First Dawn. 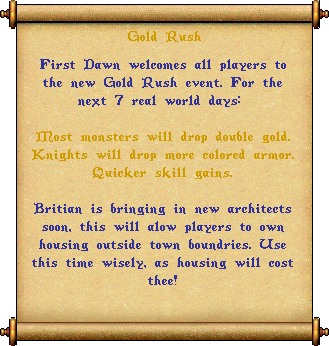 See you all very soon in the once lost realm of Ultima Online! Long awaited, Publish 1 is here. Below is a very small list of additions. Thou will have to experience for thyself the rest. Boundaries have been removed, suit up travellers. Many new mobiles have been added. 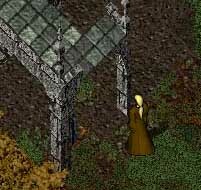 Unique NPC dialogue system, similar to that in the Ultima(offline) games. Most shopkeepers will now realistically close their shops. Some to rest at end day. In-game days will last slightly longer. Weapons & armor click labels now display a small description of their durability. NPCs might conversate with eachother. Or to thee. Paperdoll features have been reduced. Game-Window border has been removed. Each tree type now has its own graphical stages per growth. Skill gump changed to display all skills on one page. The theme takes on its traditional scroll and feather pen. Reminder, this is only a small portion of Publish 1 notes. Mining will now reveal you if hidden. Handaxe speed and damage somewhat reduced. Mace speed and damage increased. Grandmastering Magic Defense will now be acquirable. Kai Xen will only let you summon 1 Corp Wolf at a time. Poker blinds will correctly show below each players name plates. Rocks can no longer be double-clicked to start the mining sequence. Removed stone/item labels from all items. Fixed bug with Frum Tok walking through walls. Backpacks will no longer be removable and fixed a reported flaw involving them. Players who have already removed their backpack will have them replaced. Myndon will now use more spells and be much harder. Myndon and Knights will now drop colored gorgets. The following housing changes are not yet determined to be permanent. House doors can now be used from inside without a key. Contents inside containers may be stolen also. Stealth will only require a 5 second delay before using it again. A new addition to the crypt. Nearly all flowers & leaves will be harvestable and go through growth stages similar to trees and rocks. Able to craft Smith Hammers, +20 uses when exceptionally made. Able to craft Hammers, +20 uses when exceptionally made. Sewing Kit, +20 uses when exceptionally made. Dyes - Made from various materials found throughout the world. Most dyes will be made from a mixture of potions and/or flowers. Each dye has 1 use. Once used on a dye barrel, the barrel will have a limited number of uses. Dyes will NOT work on armor, weapons. Mortar Pestle, +20 uses when exceptionally made. Heal, refresh, strength, oil, spell vials and armor vials. These vials will allow its user to instantly cast the vials spell type at no mana cost or skill requirements. These vials will require mostly world harvested items and 1 empty bottle per. Armor vials will turn any plate armor into mage armor. Mage armor grants its user a no-mana-regen delay. The mana-regen-delay bonus will only work if the user has 80+ intelligence. Mage armor has MUCH less armor attributes then platemail and has NO dex penalties. Rules are that of Texas Hold Em. Currently holds an 8 player table. This is a much more efficient/faster method then using macros with your spellbook. Checks all spellbooks in your backpack (if there is more then 1) for the spell. If you speak of a mantra you do not have the spell for, it will do nothing. You must also not use any other words or spaces while saying a Mantra. Kai Xen now correctly only allows 1 summon at a time. In Corp Jux will no longer detonate upon creation. Improved graphical dirt and cobble stone tranistions. New graphical content for Ormes casino. Crossbows require arrows either bought from a Bowyer, or crafted with Carpentry. Carpenters unlock the ability to make Crossbows near 85% skill and chance to craft exceptional. Crossbows can NOT be used with shields. Skills menu slightly redesigned, Archery added. Placed homes will be fully purchased and not rentable. You may NOT rent a home while you own a placed house, you also may not own a placed house while renting. Placed homes have NO house commands, rules are that of a rental. Locksmiths will provide service to replace lost/stolen placed house keys. There is a 10 second timer to confirm the placement of your home. Homes have Decay levels, only refreshable by the owner. Upon demolishing your house, a house refund deed for the amount of its deed cost will be placed in your bank. There will be NO trade, add friend, ban or customize options. Placed homes have NO storage limit. Items will not decay inside a placed home. Houses will fully decay(and fall) after 7 real world days of no decay if not refreshed. Opening your house door as the owner will refresh the decay level. Housing may not be placed in town or on top of items. Houses must be placed on a flat surface with a 1 tile boarder from any blocking items/terrain. Mining: The mining system now works similar to trees. Rocks will provide a limited amount of resources. Once all the resources are used the rock will break down and disappear. Rocks spawn in random locations around the world. There is more bug fixes and changes coming after the evaluation of this patch. Fixed a bug with the launcher downloading duplicated files. Added 2 buttons to open webpags to EnigmaUO.com or our Youtube channel. Fixed door meesage to "That is locked." when locked from the inside. Skill caps are now unlimted, as intended. Stats may no longer be raised passed 100. Tree's & Lights... Thin of day? We have moved our site and server to an upgraded host. New players can play by going to the Join section from the main page. Tree's are now harvestable and in a more realistic manner. A tree will eventualy fall to a stump after being chopped at. Tree's have the following stages: Seed, seedling, sapling and adult. New skills: Carpentry and Harvesting. Carpentry is used to craft numerous containers and furnature. Carpenters can craft fillable buckets that can be used to water a tree. Tree's that are watered will increase their growth speed. Harvesting is used to gather resources from tree's. The construction of Slumon' Oubliette (prison) is nearly finished. In-game days will consist of 8 real day hours. Morning will scale from partly light to dark nights. At nights, lights in town will turn on. Occasionally some lights might go out. Certain creatures will spawn and roam town at night. Guards will now be much more eager to return to their patrol when being ?baited? or ?kited?. Fixed the issue with being able to attack thru the floor inside the crypt. Most creatures have a chance to drop gems that can be used to recharge communication crystals. Fireball wand bug with fizzling has been fixed. The bug with players being able to get BOD?s (bulk order deeds) from vendors has been fixed. Plate gloves were never intended, the pre-alpha sleeves worked as both. Knights & guard will no longer drop them. Potions no longer return empty bottles as they are useless. There has been a new addition to the map. You will no longer go criminal for looting any corpse. Oil flasks will last 1 second longer when slipping. Britain terrain touched up. It has never been more beautiful. Upon death you will no longer wear a death shroud. A large quest line will be added, along with interesting rewards. This update offers many fixes along with a unique quest line. will be well-balanced and suited for all play styles. due north of the Sweet Dreams Inn. Talk to ?Randulf? to get started. Britannia Homestead ? player house renting. Read more HERE. Guards will now detect criminals if outside a building that contains thy scum! Knights will no longer attack creatures unless aggressed. You can no longer harvest from trees. Mention: I am aware of many other bugs and/or inaccuracies that still remain. However the changes above were semi-major and required alot of time. The next couple days will involve alot more of the minor bug fixes.